Why do some brands succeed where others fail? Why do consumers develop deep personal attachment to some brands where others are seen merely as products, services or places to shop? Oxford’s Brand Strategy practice takes these questions seriously, and we’ve developed some powerful exercises to drive to the answers. In order to fully understand the essence of a brand, we begin with a simple question: WHY? WHY, for any brand or organization, defines the heart of the brand’s purpose and delves deep into the emotional connection and shared values that your brand has with its audience. 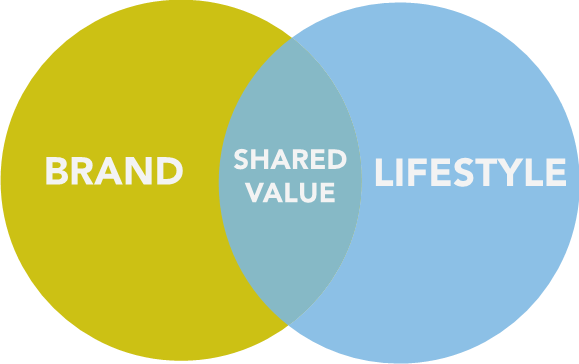 Shared Value is the intersection of your brand’s promise with your audience’s lifestyle. Once a brand has developed Shared Value with its audience, a loyalty to the brand is achieved that creates a bond similar to that of a close personal relationship, a bond that is tough to break. This methodology can also create Brand to Brand relationships that have the exact same attributes, creating partnerships that are mutually beneficial and equally as difficult to sever. While it’s common for companies to express WHAT they do and explain HOW they do it, few are able to articulate WHY they matter to those they want to connect and engage with – their consumers. Emotion drives consumers to action and it is imperative to create an emotional connection with your audiences. The importance of the emotional appeal cannot be underestimated and we fully explore it during Brand Positioning Discovery sessions with our clients. Only once we’ve discovered the essence of a brand can we bring it to life in a way that will resonate with all stakeholders.